When shopping for dorm bedding, you want to consider the material, durability, care and cost, along with a few other things. These nine tips will help you make the right choice so you can get a good night's rest. Many American dorms have twin XL mattresses to accommodate taller students. However, Dorm Smart researched 2,000 college websites for housing information and discovered there was "no consistency in mattress sizes from campus to campus." The website reports that mattress sizes sometimes changed from one room to another or one floor to another. A twin XL mattress (39" x 80") is 5 inches longer than a regular twin mattress (39" x 75"). A full size mattresses (54" x 75") or full XL (54" x 80") may be used. A few campuses might even have queen size mattresses (60" x 80"). If your college doesn't provide you with information about the bed size, be sure to check with the campus housing department. You may want to invest in a mattress pad to protect your mattress from accidental spills. There are several waterproof pads that are made out of combed cotton and are very comfortable. The pads are designed to wick any moisture away from the mattress. These are typically quilted and many are constructed with hypoallergenic polyester fiberfill. These pads also contain a polyurethane layer without having a noisy plastic sound or feel. Since dorm mattresses are not always the most comfortable, you may want to consider investing in a mattress topper. Memory foam topper: Dormco advises to shop for density over thickness. A high-density foam will have a higher "sink in softness" like their 3" Memory foam topper with 2.5 pound density. It's about $87 for a twin XL. 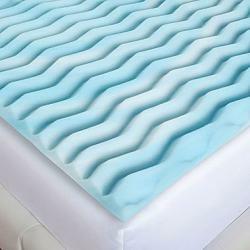 Gel foam mattress topper: JCPenney features the "Comfort Wave™ 2" liquid gel-infused orthopedic foam". The topper relieves pressure points and provides added support; it costs around $50 for the twin XL size. Target offers a Comfort RX 2" gel foam topper for around $20 in the twin XL. Egg crate topper: Bed Bath & Beyond features a Sleep Zone 5-Zone egg crate foam mattress topper for about $20 in a twin XL. If you are using a mattress topper, you will want to purchase deep pocket fitted sheets to fit over the additional height the topper creates. You'll need at least two sets of sheets so you can have a set on the bed while washing the dirtied set. While you may have a budget for more sets, keep in mind that storage space is limited and you may only have enough space to store one set with one set always on the bed. You can purchase fitted and flat sheets separately as well as pillow cases. Save money by opting for a fitted sheet only and use the comforter without a top flat sheet. Bring a couple of regular twin size flat sheets from home and purchase the twin XL fitted sheets. The flat sheet will be five inches shorter, but depending on the way you sleep, this may not be an issue and ends up being a cost-saving solution. Using either tip is strictly a personal choice. If you pay attention to sales and closeouts, you can luck out and find cheap bed sheets. There are several types of sheets for twin XL and other mattress sizes. Some are easier to care for than others. For examples, 100% cotton sheets will wrinkle and have a tendency to shrink if dried on too high heat. They often fade quicker than a cotton blend. A cotton blend, which is typically cotton and polyester, resists wrinkles and is a good colorfast fabric. You can't go wrong with a thread count of 200 -350. Bamboo sheets are an eco-friendly choice. Cotton sheets are breathable and are often a blend with polyester. Flannel sheets may be a solution for a drafty dorm room. Organic cotton is the best healthy choice but also more expensive. Polyester sheets tend to trap in heat and can become uncomfortably warm. Linen sheets wick away moisture and are excellent for those concerned about high humidity regions. However, linen sheets wrinkle excessively when laundered. Satin and rayon sheets are luxurious and make it easy to move in and out of the bed. One thing to remember about choosing sheets is that with constant wear, you will end up with food and drink spills that may leave stains that completely come out when laundered. 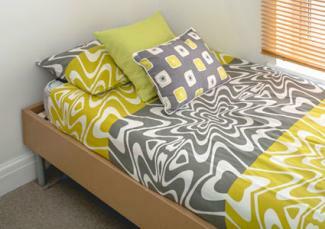 White sheets will show everything, whereas colorful patterned sheets will better camouflage permanent stains. Solid colored sheets are also a better choice than white, since white sheets can fade and yellow due to water, detergents and laundry chemicals. Choosing a comforter, duvet, quilt, or bedspread is a personal preference. The main thing to consider when shopping is how well will the fabric hold up and if it's an easy care choice. You want something that you can toss into the washer and dryer. Thin lightweight fabrics will typically wear quicker. A thick heavy cover may prove too warm for year round use. Comforter: You may want to buy a reversible comforter so you don't grow tired of the same décor. Comforters can be bulky or lightweight. Make sure you choose accordingly. Some comforters are designed for all seasons. Duvet: Choose either a down or another type of filler. The duvet is easy to change out with a new duvet cover. The cover takes up less space in a washing machine than a bulky comforter. You can with cotton, cotton blend, flannel, cotton, silk, polyester, and any fabric duvet cover. Quilts: A quilt is great to have either as a main bedcover or for additional warmth. These can be either lightweight or heavy. Many quilts are made with a thick poly filler to make them very warm choices during the winter months. Blankets: Available in cotton, plush, mico-fleece, wool or flannel, at least one blanket is a must have. Some velour blankets have Sherpa backing for added warmth and softness. An electric blanket will give you a wide range of comfort choices. Bedspread: A bedspread can be lightweight enough for summer use and made more suitable for winter by adding a blanket between the bedspread and flat sheet. This layering creates air pockets that quickly retain heat. Throw: You should invest in at least one throw for wrapping up during late night study sessions. These come as woven, knitted and a wide range of fabric choices. You'll want one or two bed pillows for sleep and a few throw pillows for sitting up in the bed during study sessions since you won't always want to be seated at a desk. Comfort: Comfort is premium when buying pillows. Some people prefer feather pillows while others are allergic and opt for hypoallergenic foam filler or memory foam pillows. You may prefer a body pillow for added comfort. Buy two types: You may want two different types of pillows, such as one that is medium firm to use for sitting up in bed while the other pillow may be made of down feathers or soft fiberfill. Pillow protection: A zipper pillow cover is a wonderful way to protect your pillow. This is then covered with a pillow case. Be sure to wash the pillow cover regularly. Throw pillows can serve two purposes. One is purely utilitarian for use when sitting on the bed and the other is as a way to decorate your dorm. Choose colors, fabrics and patterns that appeal to your design sense. Mix these with various sizes, shapes, and firmness so you have a variety to fit various sitting positions. While there are many technical considerations that you'll be focused on when shopping for dorm bedding, don't forget to pay attention to the colors, textures, and patterns. You may discover a throw pillow that sets the color scheme and theme for the rest of your bedding design. Use this opportunity to express your personal style and tastes.